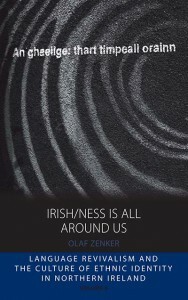 Ethnographer Olaf Zenker details a walk through the Catholic side of Ireland in this excerpt from his book Irish/ness is all Around Us: Language Revivalism and the Culture of Ethnic Identity in Northern Ireland, now available in paperback. Read Chapter One for free. On a Friday afternoon in September 2004, shortly before returning home from my ethnographic fieldwork, I took my video camera and filmed a walk from the city centre into Catholic West Belfast up to the Beechmount area, where I had lived and conducted much of my research. I had come to Catholic West Belfast with the intention of learning about locally prevailing senses of ethnic identity. Yet I soon found out that virtually every local Catholic I talked to seemed to see him- or herself as ‘Irish’, and apparently expected other locals to do the same. My open questions such as ‘What ethnic or national identity do you have?’ at times even irritated my interlocutors, not so much, as I figured out, because they felt like I was contesting their sense of identity but, to the contrary, because the answer ‘Irish’ seemed so obvious. ‘What else could I be?’ was a rhetorical question I often encountered in such conversations, indicating to me that, for many, Irish identity went without saying. If that was the case, then what did being Irish mean to these people? What made somebody Irish, and where were local senses of Irishness to be found? I left my place in Broadway and hailed one of the many black taxis that drive along the Falls Road to and from the city centre, as I had done so many times before when travelling within Catholic West Belfast. Established as a ‘community’ transport system in the 1970s when public buses for some time stopped serving West Belfast during the height of the Troubles, the classic black London taxis can be entered and exited at any point along their various routes. I got off in the city centre at the black taxi terminal, which was located in the basement of a parking block labelled ‘The Castle Junction’ in English and ‘gabhal an chaisleain’ in Irish. I took out my video camera, started filming and slowly walked up to the way I had just come. During my stay, I had only rarely used my video camera. I had been afraid that extensively filming within Catholic West Belfast would nurture suspicions of me being a spy. I had consciously decided against a cross-community research setting and deliberately focused exclusively on the Catholic side of Belfast in order to reduce such mistrust from the very beginning. However, I had still encountered suspicions that I was a spy and was aware that some locals seemed unconvinced that I was only doing research. However, shortly before leaving, I felt that filming the Falls Road into Catholic West Belfast would be no big deal. I assumed that people would take me for a tourist, and indeed, with the exception of some pupils who later jokingly asked what I was doing, no one paid attention to my filming. In the distance rose the verdigris-roofed, red brick tower of the former Broadway Presbyterian Church, which since the early 1990s has housed the Irish language, culture and arts centre Cultúrlann McAdam Ó Fiaich (‘Culture Place McAdam Ó Fiaich’). 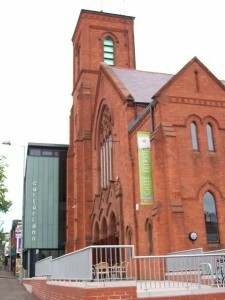 Since the 1990s, Cultúrlann McAdam Ó Fiaich (Culture Place McAdam Ó Fiaich’) has used the former Broadway Presbyterian Church of Belfast as its HQ. Moving on, I passed the local branch of Glór na nGael (‘Voice of the Gael’), an all-Ireland organization promoting the Irish language through a nationwide competition in which the achievements of local branches of the organization are rewarded. Leaving behind the ‘Voice of the Gael’, I was now approaching my own neighbourhood, situated near the junction of the Falls Road and Broadway, where I lived during my fieldwork in a flat shared with students. Some of my flatmates studied at St. Mary’s University College, which adjoined a row of terraced houses near the junction. St. Mary’s has been a teacher training college for Catholic schools since 1900. Offering courses taught in Irish since 1996 and hosting the Irish Medium Resource Unit for Irish-medium schools since 1998, St. Mary’s commitment to the language thus obviously did not stop at its gateway, where the name of the institution was also displayed in Irish: Coláiste Ollscoile Naomh Muire. 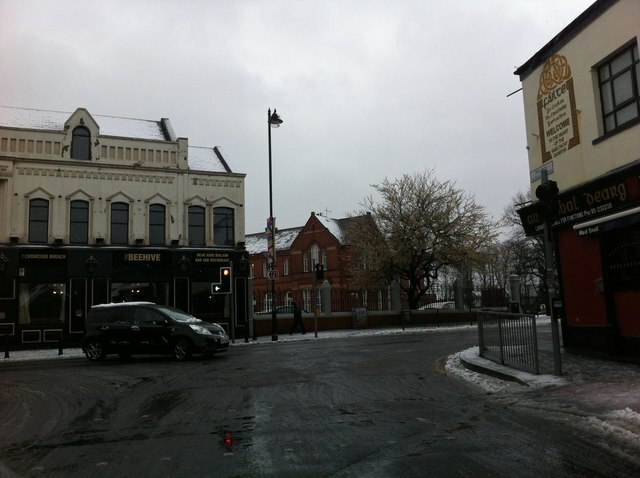 Located immediately at the junction with Broadway, two pubs – Caffrey’s and the Red Devil Bar – faced one other on Falls Road. Both regularly showed live football matches from the English Premier and Scottish leagues, as well as from European competitions. The Red Devil provided a venue for supporters of the English club Manchester United, the nickname of which gave the pub its name. Apart from sports, both pubs also offered weekly live music sessions with Irish folk, in addition to various disco nights and quiz evenings. The Red Devil Bar had recently been refurbished, and subsequently displayed its name in Irish as ‘beár an diabhail deirg’ against its bright red walls. This was symptomatic of a recent trend within Catholic West Belfast towards bilingual inscription on shop and office signs. This was not surprising given that the neighbourhood accommodated a cluster of Irish language organizations and groups, including the economic development agency Forbairt Feirste (‘Belfast Development’), which was engaged in a campaign encouraging local businesses and organizations to implement bilingual signage and services. Walking through an area that I had chosen as my ‘base camp’ for exploring representations and practices of Irish and Irishness among local Gaeilgeoirí, I reached another landmark, a mural opposite the Cultúrlann. Having been commissioned by the Irish language umbrella organization Pobal (‘Community’), this bilingual mural proclaimed ‘language rights’ to be ‘human rights’ and demanded that ‘the unique circumstances of the Irish language’ be reflected in the ‘Bill of Human Rights’. Throughout my stay in West Belfast, I passed this mural hundreds of times, and it repeatedly caught my attention, not so much because of its general human rights message but because of one particular slogan that directly appealed to and continuously reminded me of my own research interest. This slogan read: ‘Irish is all around us’. In a way, I could immediately relate to this statement. Did I not constantly experience the plausibility of this representation in daily life given the manifold presence of Irish, be it in local language organizations and bilingual signage, or in the shape of local Gaeilgeoirí? Yet, as a political claim demanding more support for an endangered minority language, was it an accurate description of reality? In what sense did this slogan reflect the actual practice of the language, and to what extent was it simply a politicized claim with little substance in daily life? And by extension, given that people constantly linked the Irish language to their Irish identity, in what sense and to what extent was Irishness ‘all around us’, both in terms of representations and with regard to lived experiences? 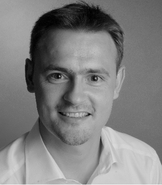 Olaf Zenker is Junior Professor at the Institute of Social and Cultural Anthropology, Freie Universität Berlin. He is the author of Irish/Ness Is All Around Us now available in paperback from Berghahn Books.